The DKW Schnellaster was produced by Auto Union after WWII. It was one of Germany’s first new automotive designs since the war ended. 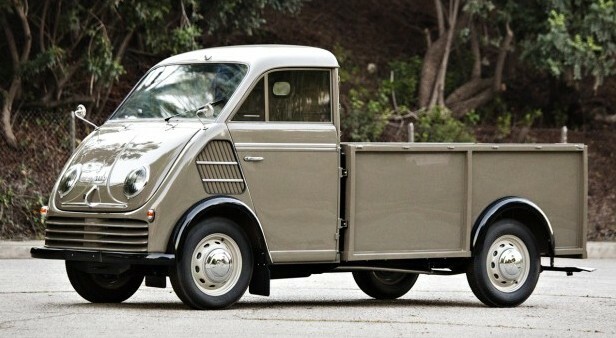 Introduced in 1949, the Schnellaster (or “Rapid Transporter”) is typically seen in van form but there were other variants available: such as this Tieflader pickup. It is front wheel drive and uses an 896cc straight-three two-stroke engine making 36 horsepower. It was kind of the first minivan… but really mini. This is the Type 3 (or 3=6) model that was the final in the Schnellaster line. It was new for 1955 and would be built through 1962. This particular example is the nicest one in the world. Really – it is the only known restored Tieflader in the world and the only Tieflader in the United States in any condition. The restoration is fresh and it should bring between $90,000-$120,000. Click here for more info and here for more from Gooding & Co. in Scottsdale.